Attending this summer’s run of Alfred Hitchcock’s surviving silent films was a mighty step toward achieving my goal of seeing every one of his movies. (And it gave me a new cocktail to try.) My Sundays with Hitch project covered many of the later suspense titles I’d missed, so only some of his early efforts remain. Thanks to Turner Classic Movies’ recent Sundays With Hitch project – no relation, but if they wanted to send a few bucks my way I wouldn’t say no – I was able to cross a few more entries off my list. The film business essentially started anew when talkies came in. You can see that rough transition play out over a single career with Hitchcock. Even a single movie; he made silent and sound versions of 1929’s Blackmail, the former still supple and occasionally breathtaking, the latter frequently stilted. “The silent pictures were the purest form of cinema,” Hitchcock said, adding, “When we tell a story in cinema, we should resort to dialogue only when it’s impossible to do otherwise ... Dialogue should simply be a sound among sounds.” His early attempts to incorporate the new technology show flashes of the élan evinced in his most accomplished silent efforts like The Lodger and Blackmail, but for the most part he fumbled along like everyone else. You know you’re in trouble as soon as 1931’s The Skin Game begins, the credits identifying it as “A Talking Picture by John Galsworthy.” And brother, do they talk. In this stuffy drama from Galsworthy’s play about rival families feuding over a piece of land, much of the dialogue – one character prefaces every utterance with “I say” – now reads as comic. When the plot finally generates some melodramatic momentum, it’s too late. Hitch’s sympathies clearly lie with the self-made sort played by Edmund Gwenn, or maybe it’s just that Gwenn manages to give a lively performance. So does Hitchcock favorite Phyllis Konstam as Chloe, the silly girl who pays the price for the machinations of the gentry. Whenever Hitch dispenses with dialogue, as in an auction scene or the local lord’s hellish vision of what will become of the real estate should he not acquire it, the movie briefly sparks to life. The same is true of Rich and Strange, also from 1931. The opening sequence, showing the protagonist’s journey home on a rainy evening, unspools like an entertaining silent comedy. Then he gets there, and everything falls apart. A feckless young married couple, about whom it’s impossible to care, are given the resources to live the good life. They set out on an ocean voyage and in no time flat are eyeing other partners. The ‘strange’ portion of the title is bang on, as the movie’s tone varies wildly from limp comedy to knockoff Noel Coward to apocalyptic dread. Hitch gets to stage his finale on a sinking ship, but by then expectations have sailed over the horizon. 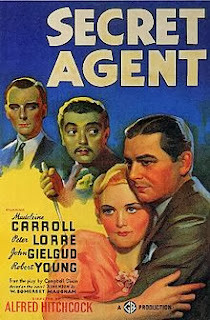 Tone isn’t the issue in Secret Agent (1936). It’s a Hitchcock movie through and through, following the template established in its predecessors The Man Who Knew Too Much and The 39 Steps. It’s the plot that’s half-baked and ultimately irrelevant in this oddball adaptation of W. Somserset Maugham’s Ashenden stories. John Gielgud’s novelist learns he’s been killed off by the British government, the better to be shanghaied into the intelligence service, and his response buries the needle on the “pip-pip, cheerio” meter. A full complement of Hitchcock set pieces is on display; when you hear Gielgud’s contact is an organist at a remote Swiss church you settle in, knowing what you’re going to get. The film doesn’t make a lot of sense and is disturbingly indifferent about collateral damage, but one must admire the verve. Best of all is Peter Lorre’s performance as an amiable psychotic who happens to be working on the side of the Union Jack. I couldn’t help thinking of the Lorre/Hitchcock relationship as a precursor to that between Christoph Waltz and Quentin Tarantino. Cast an Austrian-born actor as a villain (the original Man Who Knew Too Much, Inglourious Basterds) and fall so hard for his performance that you have him back to give it again, this time as a good guy (Agent, Django Unchained). I’m down to Hitch’s curios and obscurities now. I intend to press on.